We supply a variety of locomotive types, available for lease and rent. Check out our fleet and if we do not have the locomotive you want, let us know and we will work to find one that fits your needs. Click the picture to see our roster. SW-10 Locomotive LSLX 1261; click on the picture above for specs and information. 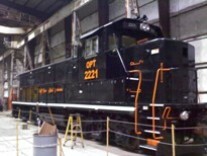 Locomotive 2214, Ready for Lease; 1200 HP switcher locomotive, 26 air system, Lease for as low as $100.00 a day, we also offer Full Maintence Lease packages. Click on picture for more Info and Pictures . We have several SW-900 EMD switch engines for lease and available now. The 900 horse power engine provides the tractive effort you need while saving in fuel cost. Click on the picture above for more info. NRE 2GS-14B GenSet Units; We have a variety of available GenSet locomotives and the mechanical forces to back them up. Click on picture for more information. GP-10 Units for lease; we have multiple units in stock ready for lease. Call or e-mail us for rates. We are driven to provide world class service & locomotive solutions for our customers and their needs. Click on picture for more info. We offer 24/7 Locomotive Repair at your location or our shop. When you're down, we're out! Welcome to Lone Star Locomotive Leasing LLC and affiliated companies. We specialize in leasing railway locomotives to industrial and shortline customers throughout the US, offering both full service and net leases. You will find us to be honest, forthright folks who work with you to meet your needs in the most cost effective manner possible. Our partner companies; Superior Locomotive Repair , Lone Star Locomotive Repair, Gulf Coast Rail Services, and The Orange Port Terminal Rwy are trusted names in the locomotive industry. They are well known for having some of the nation’s best technicians operating out of service trucks 24/7/365. These service trucks are stationed at key locations throughout the US. At our railroad service center in Orange we also offer complete locomotive restoration, low & high voltage rewire, wreck damage repair, and just about anything else you would ever need done to a locomotive. Check out our current inventory of locomotives that are available for lease. If we don’t have exactly what you are looking for, let us know. We work hard to acquire and provide our clients with whatever they need. If you would like assistance exploring alternate opportunities in locomotive fleet planning for your company we would be happy to help. The two principals of these companies, Henry Chidgey and Tracy Young, have combined over 60 years of railroad locomotive and freight car experience. Net Lease or Full Service Lease with Maintenance ? Why Lease from Lone Star Locomotive Leasing and sister companies ? Can your company provide Maintenance contract ? Can the Locomotives we lease be painted with our company colors and logos ?